Improve your accuracy with our versatile 8-12" bipod. Mounts to Picatinny rail. No external springs. Quick release push button for leg extension with push button guard. Legs fold fully forward or backwards. Legs can be detached with two swift movements for use on rocky terrains. The entire mechanism is encased to prevent dirt and sand infiltration. Concave base mount cradles the weapon providing a lower center of gravity and includes a removable 3" Picatinny rail to attach a forward grip or other accessory. Each leg operates separately and independently. Legs can be set at different heights for use on uneven terrain. Serrated rubber feet for use on smooth surfaces. 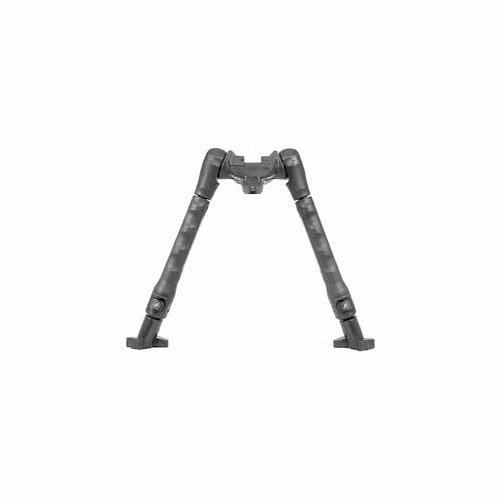 Improve your accuracy with our versatile 8-12" bipod. Mounts on to Picatinny rail. Legs fold fully forward and backwards. Legs can be detached with two swift movements. If you have any questions about this product by CAA, contact us by completing and submitting the form below. If you are looking for a specif part number, please include it with your message.